Where do I register my son or daughter? When you arrive to the page, you should see several 'Register Now' buttons with a green checkmark. Select the one that is designated for players. It may be titled differently by your league/club, but should state 'player' in the title. How do I register to multple clubs for tryouts? You will need to register with each club your child wants to tryout with, but only if that club has enabled/is using Stack for Tryout registration. This will require an account to be created with each club, however you can use a single sign-on (same login credentials across all clubs). You will receive a notification from the club if your child makes a team. In order to accept the team placement for the club of your choice, login to your member account and click the Accept button. Any fees charged by that club will then be generated to your account after acceptance. Do you have a guide to registration? In short, you will be asked to set up an account and select the age group your child is playing in. You will then fill out a registration form. Next, if your club has opened waivers, that will follow your completion of the registration form. Following waivers will be a Confirm Payment page - even if your league or club is not collecting fees, you need to continue through this page. Otherwise, your registration will not be confirmed. Following this, you should reach the Confirmation page and can continue to your Member Login (aka Family Account). 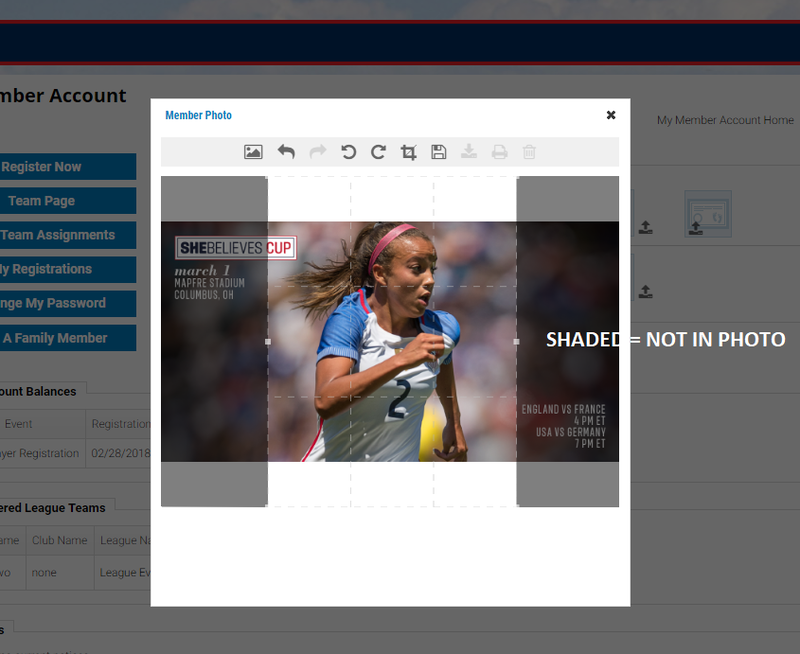 When clicking the Register Now button, you will be prompted to create a Member Account in US Soccer Connect with a unique username and password. This single family account can be used for multiple player registrations and allows for the management of all members via one set of login credentials. Once created, you can access your account by selecting the Member Login button anytime on your club or league website. Who will be the primary contact and will we need two seperate account for correspondence if the players' parents do not live together? What are the specs for the required uploads? How do I use the photo cropper inside registration and the Family Account/Member Login? A photo of the size 300x400 pixels fits the cropper perfectly. Again, we recommend you attempt to fit those dimensions outside the use of the Stack crop function. If you cannot, then you will need to crop and rotate your photo. The shaded areas on either side of your photo will not be included in the final save. You can click and drag the crop frame so that it centers over the face, as you see above. The photo above is a poor picture because of the white space that will occur on the top and bottom. We do not recommend using photos like this. Click the save (floppy disk) button when done. What does the red Member Login button do? The red Member Login button located at the top right of any 'yourclub'.osysalive.com site is for parents and coaches to use after you have completed registration. This is essentially your Family Account, where you can check the team assignment of your children, pay fees, change your account password, and add family members to the account. What is the Register Now button in the Family Account/Member Login? After you have signed up for an account with Stack Sports at your league or club page ('yourclub'.osysalive.com), you may click the Register Now button to register a player to an event at the league or club. This could be a season registration, or a registration for a camp or other event. Make sure you contact your league or club before you proceed at this link so you are aware of what registration button you should click. What is the Team Page button in the Family Account/Member Login? If your club has enabled Team Connect and your child is assigned to a team, you can click this button to access the web version of Team Connect. Team Connect is a portal that can be used to communicate with the team, view schedules, and more. What does the Add A Family Member button do in the Family Account/Member Login? This allows you to add additional family members into your Stack account, such as mom, dad, grandpa, grandma, etc. This button does not register another player to the league or club. Can I upload data for players into US Soccer Connect? Uploading data is not currently an option. Stack Sports-US Soccer Connect is the new provider. Updated player and coach data is needed from either parent or club at the point of registration. This information is collected during the initial registration and stored for future reference. The workload decreases significantly in subsequent years for both the club and parents. How can players be released to join a new club? Please contact your club to initiate this process. Your club will need to submit the Player Transfer Request form to Ohio South and the appropriate league(s). Why doesn't my child have a FIFA ID Number? FIFA ID numbers are only assigned to players U11 and up. Where can I print my player forms, including Lindsay's Law and Medical Release? Log in to Member Account. Find player and click Print Form (will download as PDF).